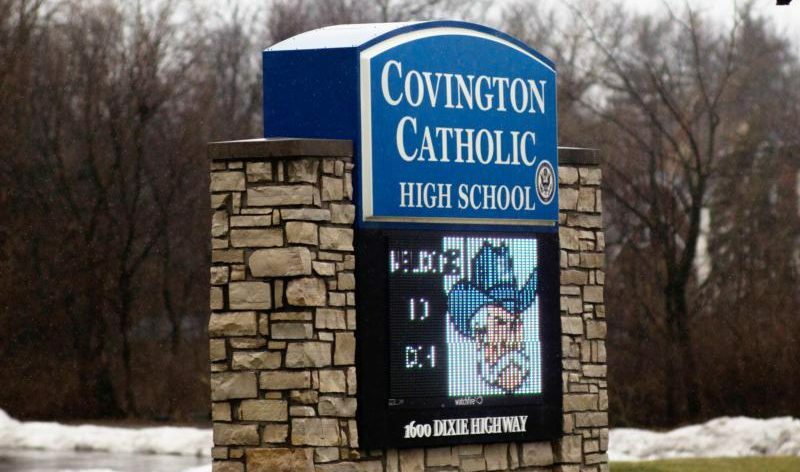 COVINGTON, Ky. (CNS) — You could literally hear a pin drop as the faculty, staff and student body of Covington Catholic High School waited in the gym Jan. 23 for the arrival of Covington Bishop Roger J. Foys. The bishop was there to address the students about the events that took place Jan. 18, after the March for Life in Washington, where a student standing face-to-face with a Native American elder was captured on video and ignited a firestorm on social media — making headlines around the world. “It was a wonderful day, filled with real grace. That night I slept peacefully. It was the last night I’ve slept peacefully,” he added. The following morning, he said, he and diocesan staff members began to receive calls and emails from news stations and people from all over the world commenting about the situation. By the next morning, Jan. 20, the diocesan website, he said, was receiving over 200,000 hits per hour and more than 10,000 emails per hour — which crashed servers. Staff phones rang persistently for days until voicemail boxes were full with calls from media or those who wished to comment on what happened. “Soon, my brother bishops began to text me worrying about my welfare and yours. People care about you. People love and care and are concerned about the church and they are concerned about you,” he told the group. He said as Covington’s shepherd he has to present the facts not only the diocese but to the world. “Not the facts that someone has imagined or the facts that someone thinks or facts that people might determine from seeing a video,” he explained. “I encourage all of you, especially the students who were there at the march, to cooperate with the investigators. This is with the permission of your parents. Bishop Foys also said the investigation would take time in order to be thorough. “Some people’s lives, as you know, have been affected for the rest of their lives and the honor of our school has been tainted. We have received, and probably you have received, horrible, vile e-mails. This brings out the worst in people,” he said. “A person can be doing something that is absolutely innocent but if he gives the slightest hint, the slightest perception, that this is something wrong that is what people are going to remember, and then for them that becomes their reality,” he added. He also addressed the initial joint diocesan and school statement about the incident and the criticism it received for being too strong. “In my mind with what we saw and what we heard at the time, we had to say what we said and we meant it. If that behavior is genuine, then we have to condemn it. ” He added that a second statement was issued Jan. 22. “Regardless of what you heard or what you’ve read or what you think, I am on your side. I want you to come out of this in a positive light,” he said. In the updated diocesan statement, he asked people “to pray that we will arrive at the truth,” he said. “The only way we can do that in an objective way is through a thorough and in-depth investigation. It is my hope and my prayer that, in the end, it will show exactly what happened and that we will be able to stand tall and proud,” Bishop Foys told the assembly. In closing, he reminded the students how much he supports Catholic education and Covington Catholic High School in particular. “Know that I stand with you. … Together we will work through this,” he said. Keener is editor of The Messenger, newspaper of the Diocese of Covington. I would not call them innocent. They participated in this entire mess when they could have walked away. They taunted that native American group when they could have walked away. He smirked in the face of an elderly man when he could have turned the other cheek. If we are going to teach our children love and respect of the Lord and we should show them it is also needed to show love and respect for their fellow man. Babying them will not help them grow up to be men. And pretending like they did nothing wrong will not show them how to be good people. Stand with the boys 100%. Its a disgrace what the media did to these innocent minors. Was it the editing or did this meeting lack any teachings of Christ?